As part of efforts geared towards realising the mandate of disseminating information on proven agricultural technologies to farmers and other stakeholders in agriculture, the Agricultural Media Resources and Extension Centre (AMREC) has started an on-air farm broadcast on FUNAAB Radio 89.5 FM. The Programme titled, “Agbe-Sunwon” is a weekly programme aired every Wednesday between 2pm to 3pm, with a repeat broadcast on Saturday between 6pm to 7pm. 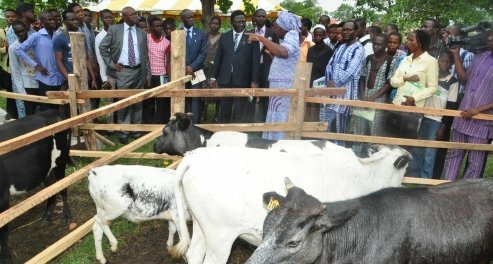 According to the Director of AMREC, Professor Dorcas Adegbite, the Radio programme is one of the activities of the Centre poised at providing timely and beneficial information to farmers and other stakeholders. Professor Adegbite further revealed that the Centre is working on another Programme titled“ Boti lo loko” which is expected to go on air soon, adding that with the continued support of the University Management, AMREC will deliver on its mandate. Meanwhile, at the maiden broadcast of Agbe-Dotun, she informed the public of the activities, mode of operation and major achievements of the Centre. According to her, the Centre has five operational Programmes namely; Extension and Adaptive Research, Training and Farm Demonstrations, Gender Issues and Youth Development, Media and Farm Broadcast, as well as Planning, Monitoring and Evaluation.